The summer is the perfect time to get the family outside and enjoying some sunny weather and what could be better than finding a new passion for your children to get involved in? Horse riding might be the perfect hobby for youngsters to enjoy, learning valuable new skills along the way. Here at The Insurance Emporium, we think that an adventure on horseback could be the ideal way for your children to make the most of their time. That’s why we put together this guide on the reasons that you should consider getting your child into the saddle. Anyone who has ever ridden a horse will know that it can be a physically tiring way to spend your time! The core muscles, thighs and pelvis are all engaged to help you keep balance on the horse. On top of this calorie-crushing exercise, there are also the benefits of vitamin D from the sun and lungs full of fresh air to think about! This isn’t about disciplining your child through horse riding! More so the self-discipline that a child will learn from learning to ride a horse! Patience and control are key attributes for a successful horseback rider and your child will hopefully learn these in abundance. Anyone who has young children will know that they sometimes have a habit of falling over as easily as a Premier League footballer! Your child’s balance and co-ordination will be put to the test whilst riding, so should improve over time. Many stables insist that you get involved in some of the everyday chores such as mucking out before you get to ride. This could be vital in teaching a child the value of hard work and how this can result in reward. It might help to teach them that the good things in life are a privilege that should be earned! Being surrounded by likeminded children, sharing the same interest could do your child a great deal of good and help them learn important social skills. With these new friends sharing the same hobby as your children, they could well find themselves with pals for life! It can be a scary thing for anyone to climb on top of a horse that’s twice their size, so just imagine how it must feel for a child to mount up! Learning to work together with their steed and build an understanding and chemistry could be a great way for them to grow their confidence in all aspects of life! Let’s be honest, when you’re helping your child get into a new hobby the most important thing is to make sure that they’re having fun! As opposed to staring at a screen when they finish school, your children could find plenty of fun on horseback! 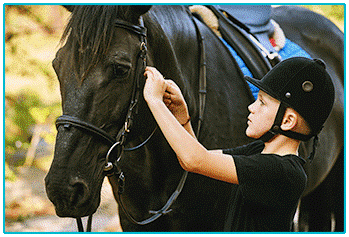 An equine adventure could be the ideal way for your child to find a new passion this summer! With so many potential benefits, it might be the perfect pastime! 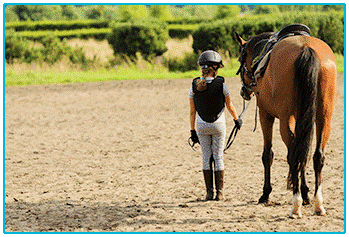 If you do decide to help your children get into horse riding, it could be worth considering some Horse Rider Insurance to help cover them should the unexpected happen. At The Insurance Emporium, our Junior Horse Rider policies cover children from the age of five and all new policies include a 15% Introductory Discount*! Head to The Insurance Emporium today to find out more! *15% Introductory Discount is available for the first 12 premium payments on lunar and calendar monthly policies or one premium payment on annual policies.